The 2005–06 season was Juventus Football Club’s 108th in existence and 104th consecutive season in the top flight of Italian football. Adrian Mutu from Chelsea and Patrick Vieira from Arsenal joined the team. Fabio Capello after the Serie A Championship of the season 2004-2005 was leading the team for the second season. 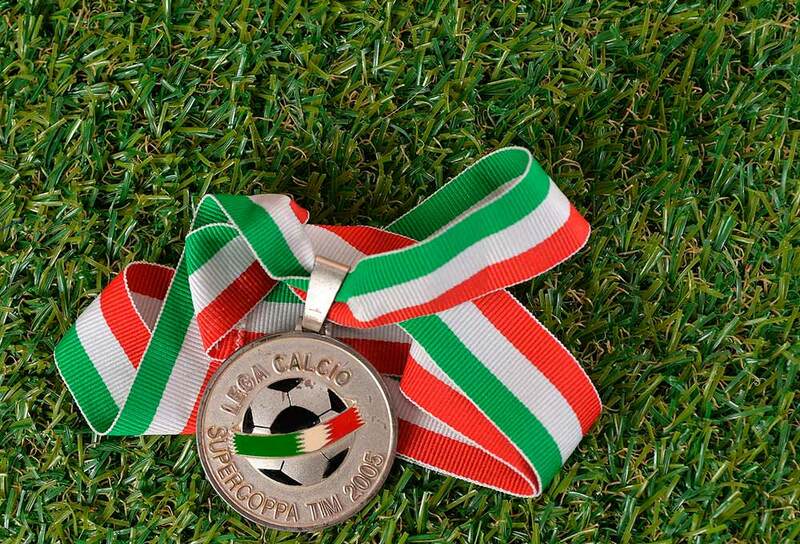 The season started with the Italian Supercup’s defeat against Internazionale F.C. The Serie A season started in a great way with 9 following victories. Second year of Fabio Capello and second following Scudetto for Juventus. But something was going to happen. 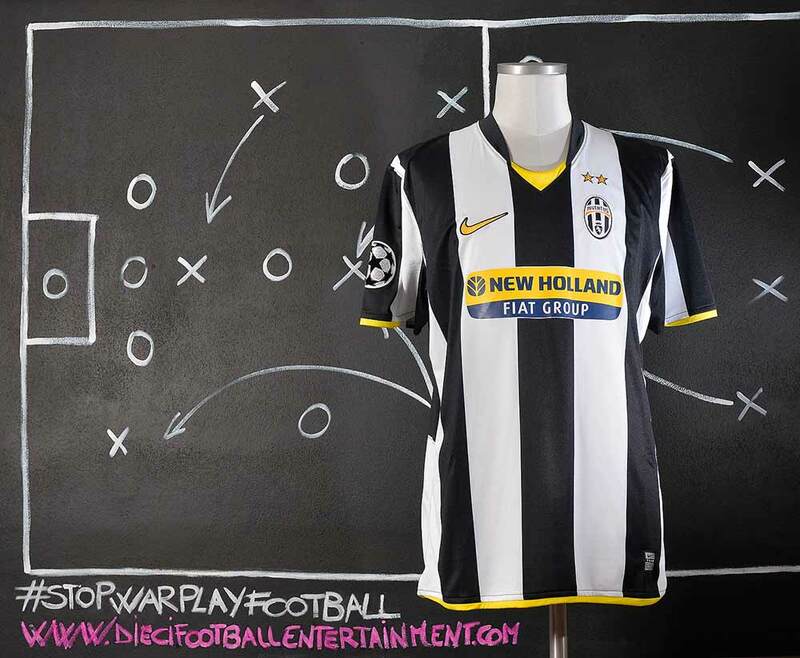 Juventus F.C. reached an amazing record in Serie A with Fabio Capello as coach. 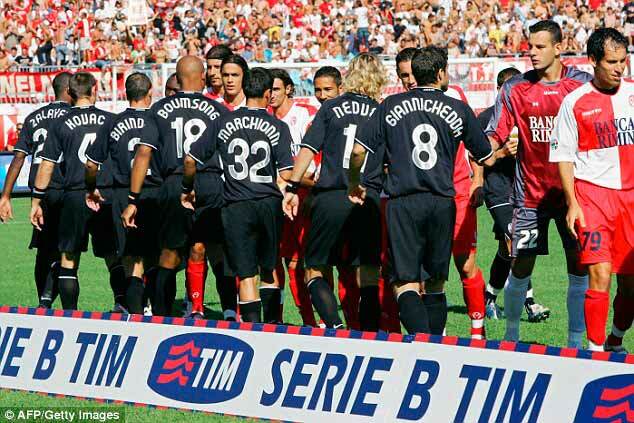 The team was in top position in the Serie A championship for 76 games between 2004-2005 and 2005-2006 seasons. The 2005-2006 Champions League season wasn’t good as expected. The team went out against Arsenal F.C. in the quarter-final leg. That was quite weird considering the quality of its players. 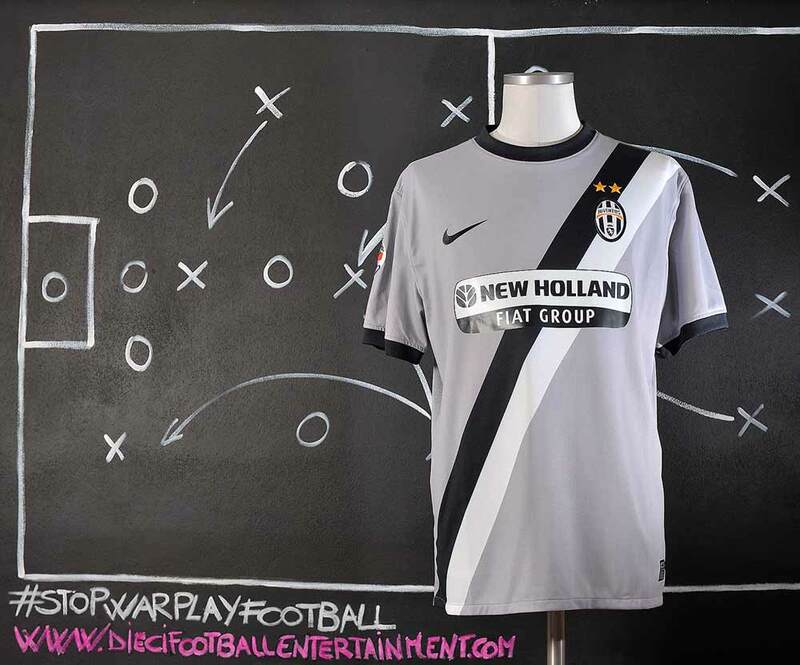 Juventus F.C. was considered one of the favorite teams to lift the Champions League trophy. 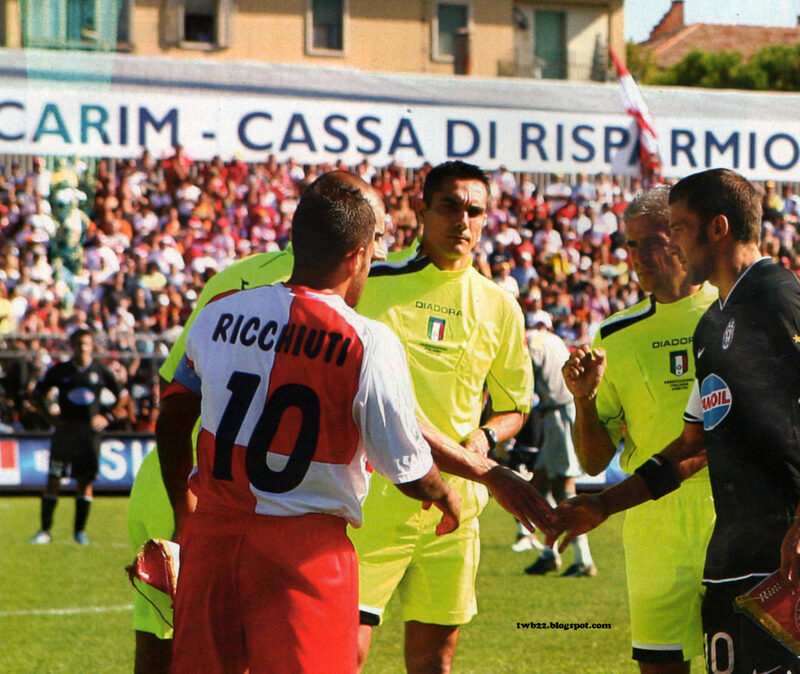 The team was awarded in Bari on May 14th 2006 for the Serie A’s victory. 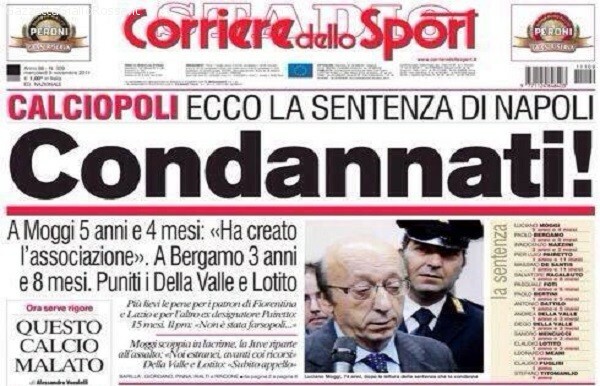 In the same day the biggest issue on Juventus’s history was about to happen. 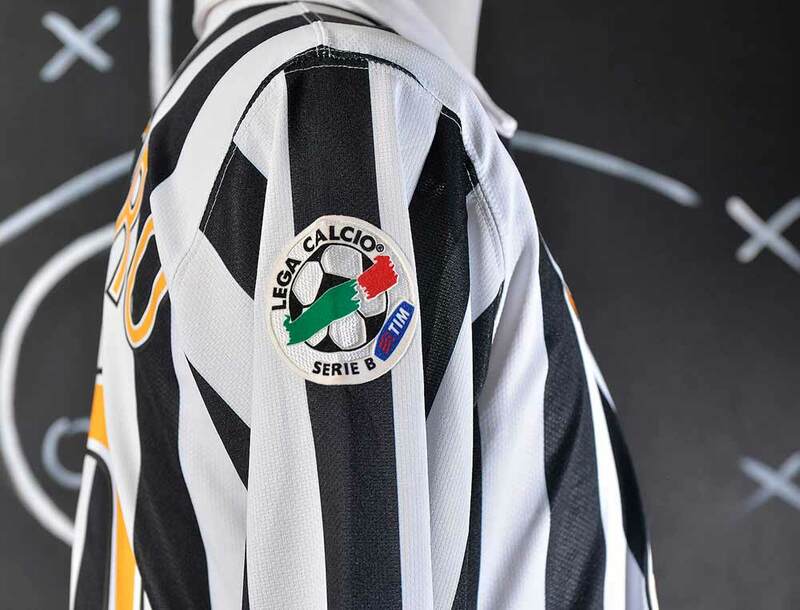 The 2006 Italian football scandal, or Calciopoli in the Italian-speaking world, involved Italy’s top professional football leagues, Serie A and Serie B. 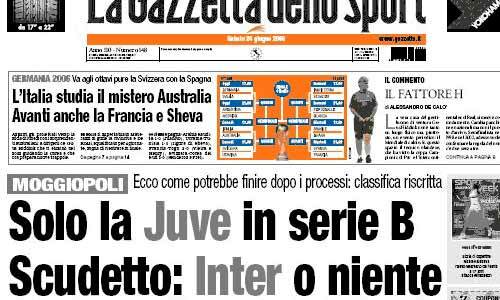 The scandal was uncovered in May 2006 by Italian police, implicating Juventus F.C. and other major teams including Milan, Fiorentina, Lazio and Reggina when a number of illegal telephone interceptions showed a thick network of relations between team managers and referee organizations, being accused of rigging games by selecting favourable referees. The scandal first came to light as a consequence of investigations of prosecutors on the Italian football agency GEA World. Transcripts of recorded telephone conversations published in Italian newspapers suggested that, during the 2004–05 season, Juventus general managers Luciano Moggi and Antonio Giraudo had conversations with several officials of Italian football to influence referee appointments. 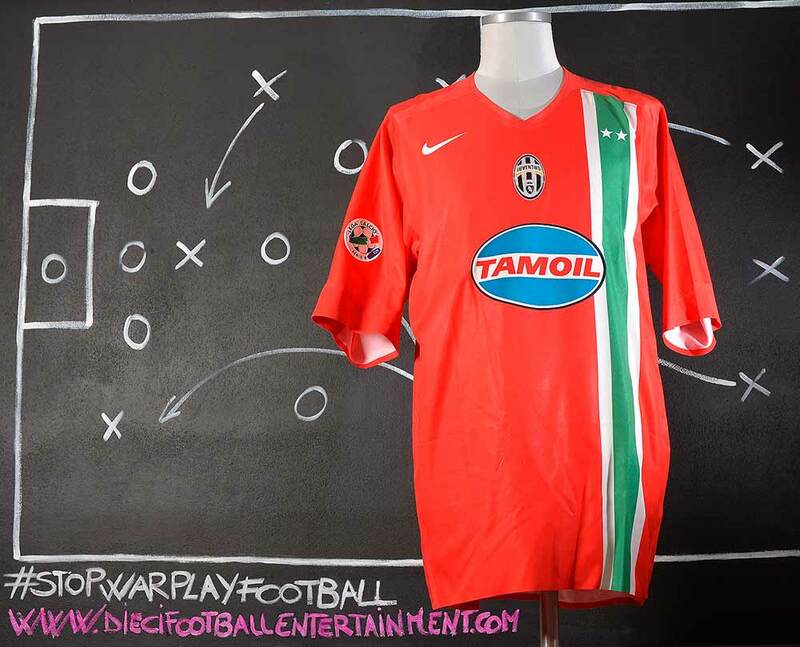 The name Calciopoli (which could be translated as “Footballville”) is an ironic adaptation of Tangentopoli (“Bribesville”), which is the name that was given to some corruption-based clientelism in Italy during the Mani pulite investigation in the early 1990s. On 4 July 2006, the Italian Football Federation’s prosecutor Stefano Palazzi called for all four clubs at the centre of the scandal to be thrown out of Serie A. Palazzi called for Juventus “being excluded from the Serie A Championship and assigned to a lower category to Serie B with 6 points deducted”, without a specific division stated, while for Milan, Fiorentina and Lazio to be downgraded to last place in the 2005–06 championship and relegation to Serie B. He also asked for point deductions to be imposed for the following season for the clubs (three for Milan and 15 for both Fiorentina and Lazio). The prosecutor also called for Juventus to be stripped of its 2005 and 2006 titles. 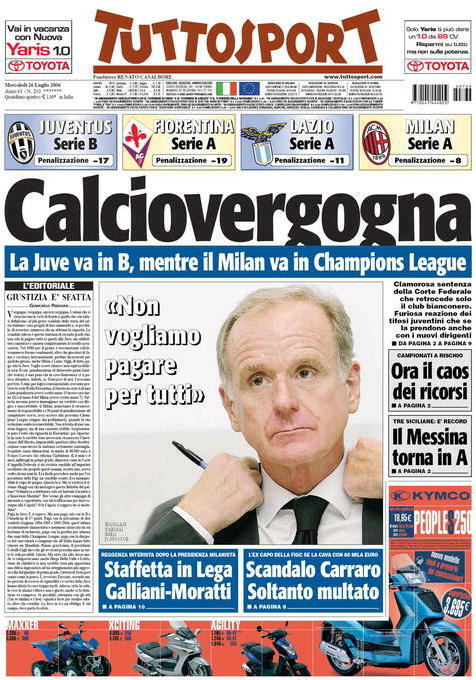 The sentence was long disputed because of the severity of the punishment meted out to Juventus compared to the other teams involved. According to the court, the conduct of team managers was considered in all cases. While not real match-fixing, it was a violation of sporting principles. 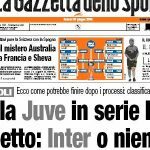 In the case of Juventus, their conduct seemed to be designed to influence match results, while in the case of other teams, the evidence against them was not considered as strong. Juventus’ representatives considered this assumption totally arbitrary and argued that the case against them was never proven. 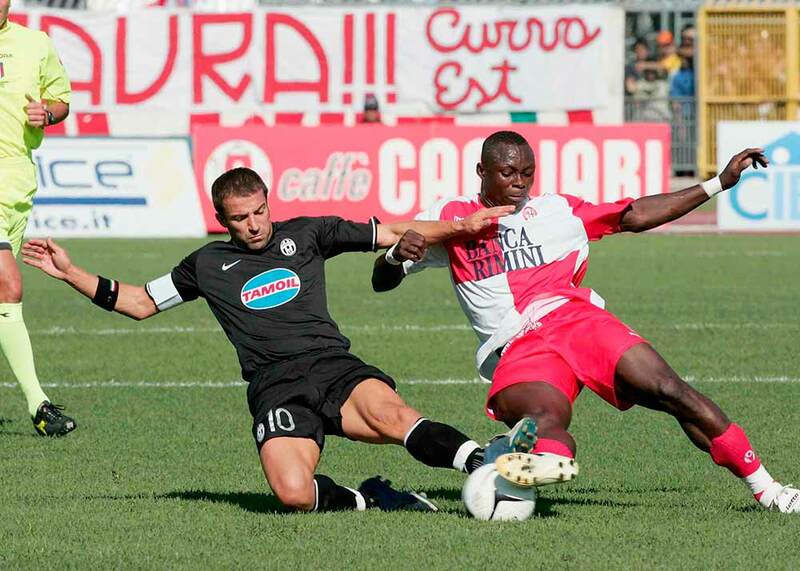 The clubs sent down to Serie B were initially expected to have a difficult road back to the top flight. They would have had to finish in the top two of Serie B to be assured of promotion and also had to avoid finishing in the bottom four to avoid being relegated to Serie C1. 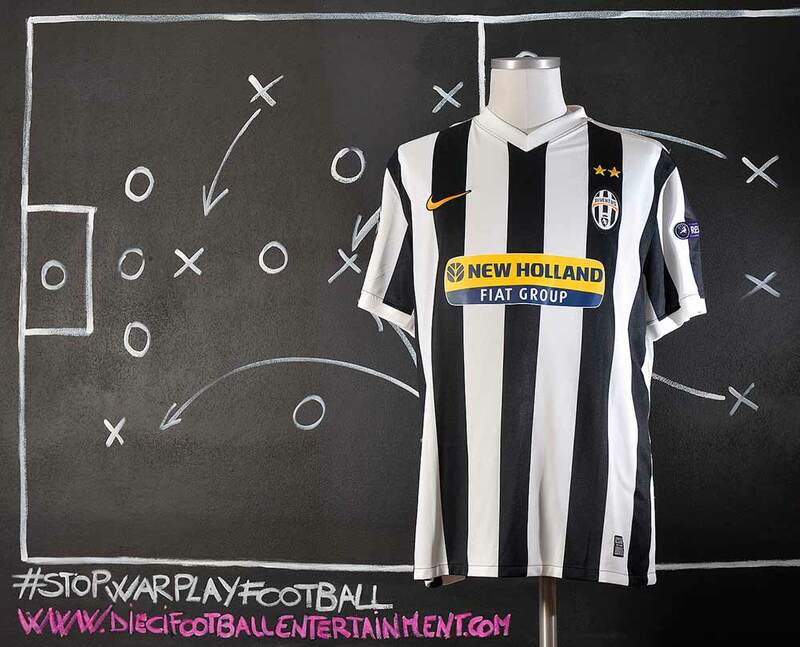 Juventus, for example, were initially docked 30 points – the equivalent of having ten wins nullified. This made it very likely that they would not return to Serie A until 2008 at the earliest. The point penalty, however, was reduced to nine points, giving Juventus a fighting chance at promotion. 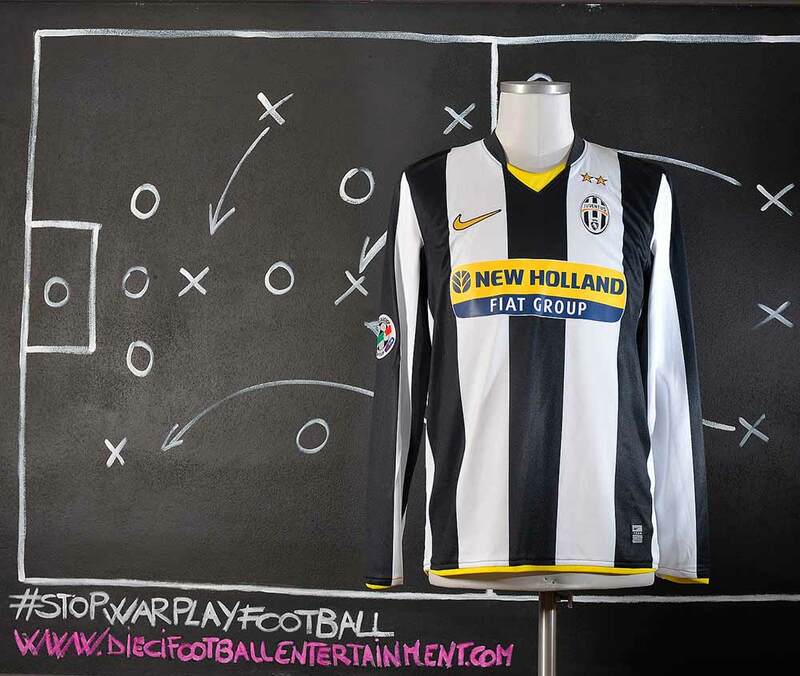 They went on to win Serie B in the 2006–07 season to make a swift return to Serie A. The relegation of Juventus also prompted a mass exodus of important players such as Fabio Cannavaro, Lilian Thuram and Zlatan Ibrahimović. Some thirty other Serie A players who participated at the 2006 FIFA World Cup opted to move to other European leagues in the wake of the scandal. Juventus’ entire board of directors resigned on 11 May, while Moggi resigned shortly after Juventus won the 2006 Serie A championship on 14 May. On the Borsa Italiana, Italy’s stock market, Juventus shares had lost about half their 9 May value by the 19 May. 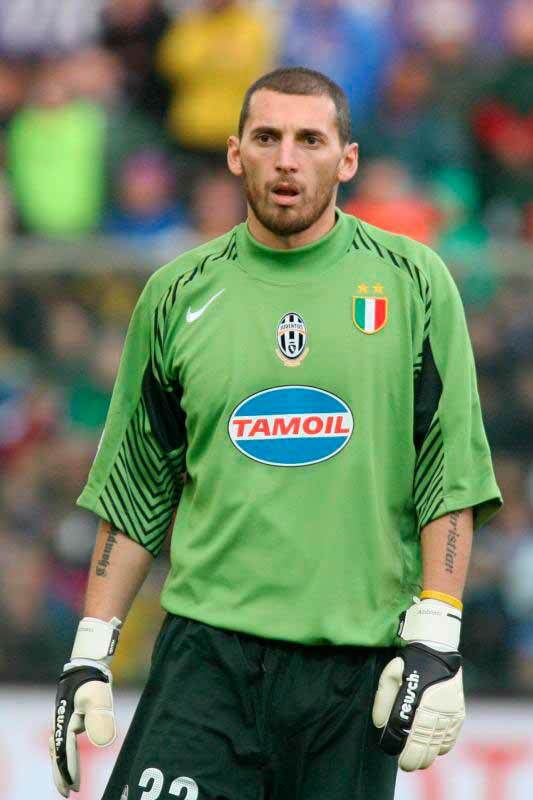 Christian Abbiati was was shipped to Juventus as a temporary replacement for incumbent Gianluigi Buffon, who had suffered a dislocated shoulder during the Luigi Berlusconi Trophy match against Milan in August 2005. Milan A.C. then offered to loan its goalkeeper to Juventus F.C. With long-awaited regular playing time at his disposal, he flourished with the Bianconeri, but when Buffon returned to the starting lineup six months later, Abbiati’s services were no longer needed, and he left at the end of the season. 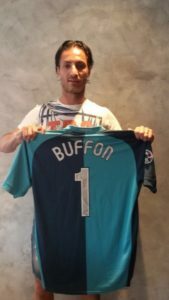 In August 2005, Buffon collided with Milan midfielder Kaká during the annual preseason Trofeo Luigi Berlusconi match, suffering a dislocated shoulder that required surgery. 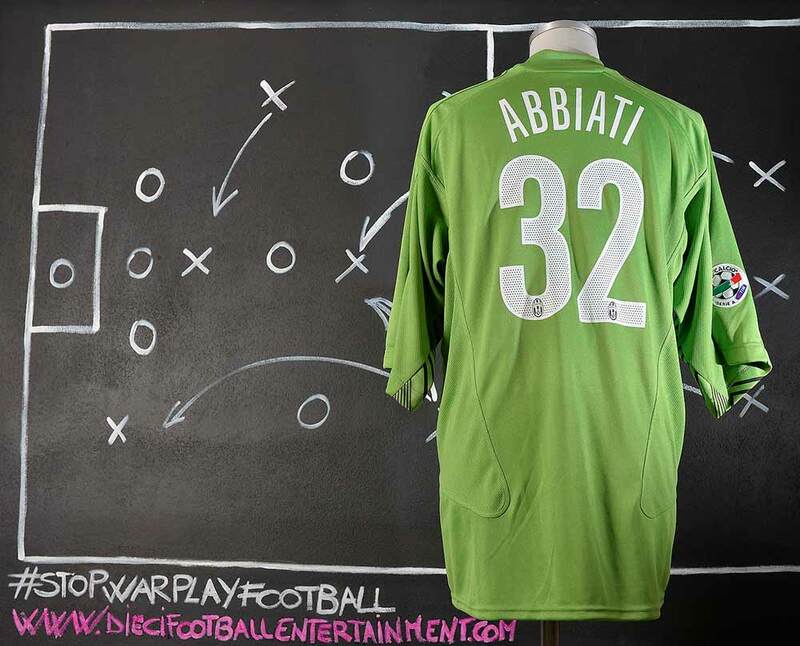 Milan loaned backup goalkeeper Christian Abbiati to Juventus as compensation while Buffon recovered. Buffon returned to the Juventus starting lineup in November, but injury again sidelined him until January. He recovered in time to help Juventus win their second consecutive Scudetto and his fourth overall, returning to the starting line-up in January 2006, in an Italy Cup match against Fiorentina. Juventus were, however, once again knocked out in the quarter-finals of the Champions League by runners-up Arsenal and Buffon regularly played the last two Champions League legs of the season against Werder Bremen and Arsenal. 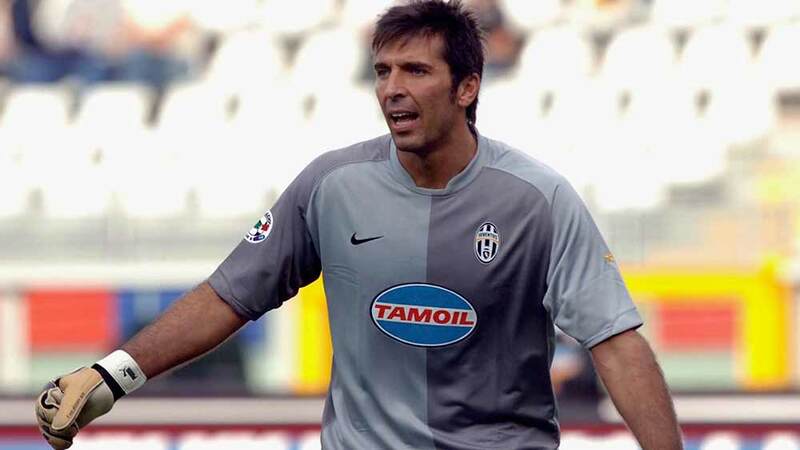 Buffon made his 200th appearance for Juventus that season in a 2–0 away defeat at the hands of Arsenal in the quarter-finals of the Champions League. 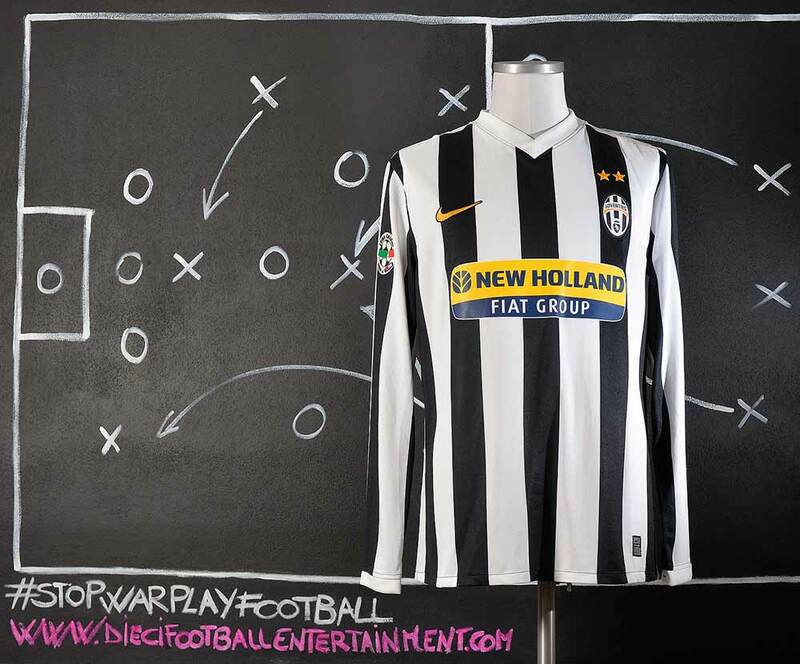 The 2006–07 season was Juventus Football Club’s first season in its history in Serie B following the 2006 Italian football scandal, leaving Internazionale as the only Italian club never to have been relegated. 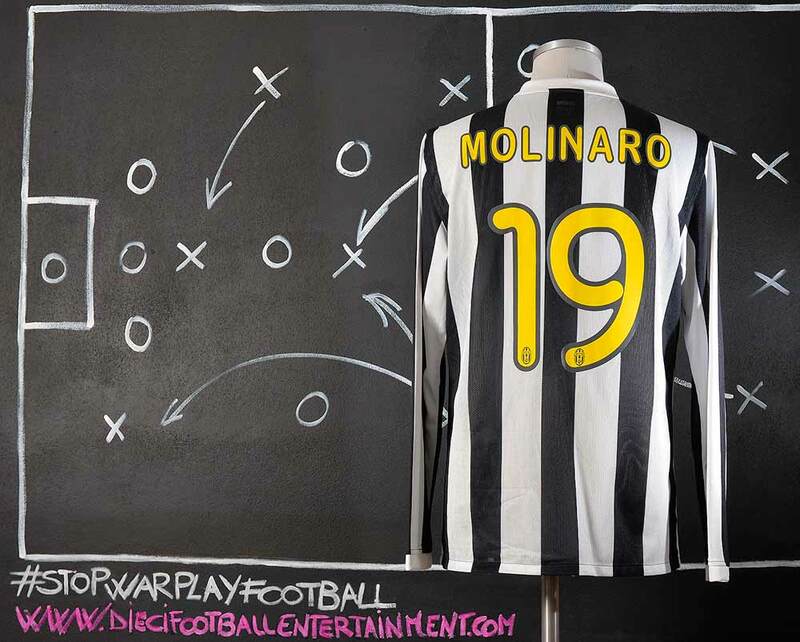 Juventus were docked nine points this season (repealed from the original 17 point deduction). 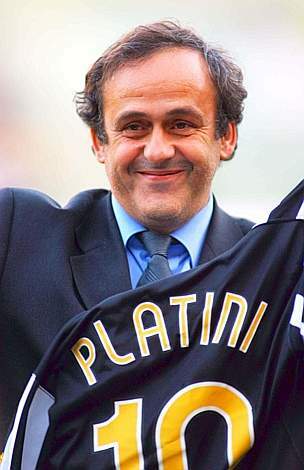 Following the enforced relegation, Juventus lost Fabio Cannavaro and Emerson to Real Madrid, Lilian Thuram and Gianluca Zambrotta to Barcelona, Adrian Mutu to Fiorentina, and Patrick Vieira and Zlatan Ibrahimović to Internazionale. Del Piero finished the league campaign as the top scorer of the 2006–07 Serie B season, with 20 goals. During the season, Del Piero also managed his 200th goal with Juventus on 21 October 2006, in a 1–0 league victory over Frosinone. 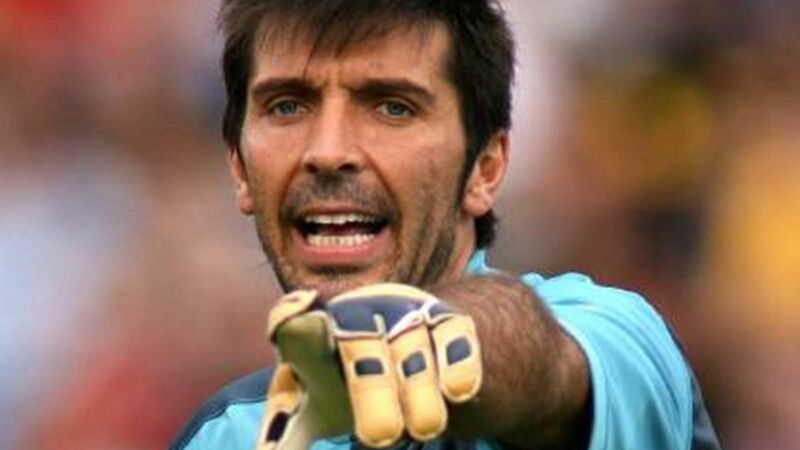 Buffon, against expectations elected to remain with Juventus, despite the team’s relegation, a decision which made him extremely popular with the Juventus fans. 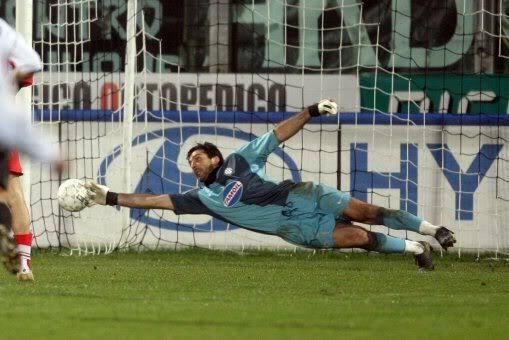 During the 2006–07 Serie B season, Buffon made his debut in the Italian second division in a 1–1 away draw against Rimini on 9 September 2006; later that year, he also received the first red card of his career in a 1–1 away draw against AlbinoLeffe on 18 November. In total he made 37 league appearances throughout the season. After Juventus won the Serie B title, earning promotion to Serie A for the 2007–08 season, Buffon signed a contract extension with Juventus until 2012. 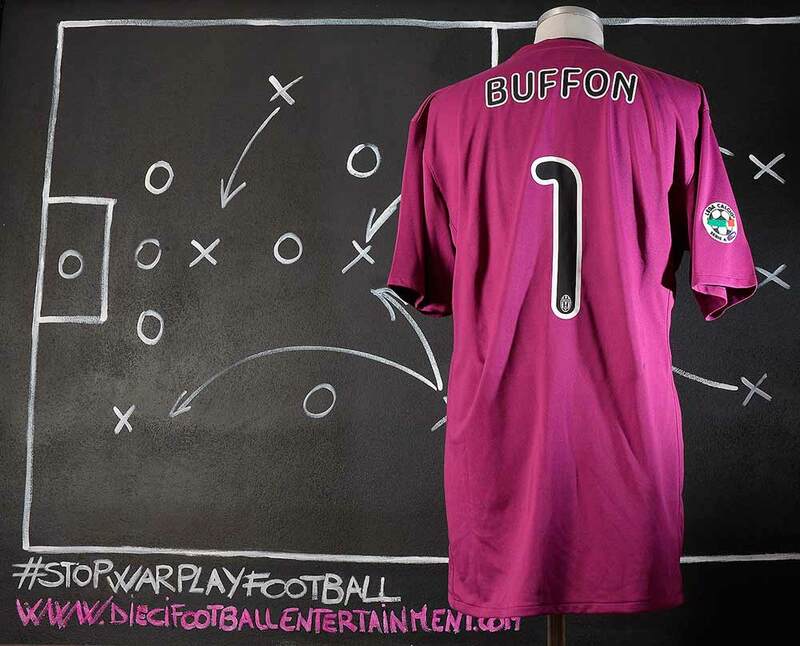 In 2007, Buffon was also elected as the goalkeeper for the 2007 FIFPro XI for the second consecutive year, and the IFFHS World’s Best Goalkeeper for a record-breaking fourth time. 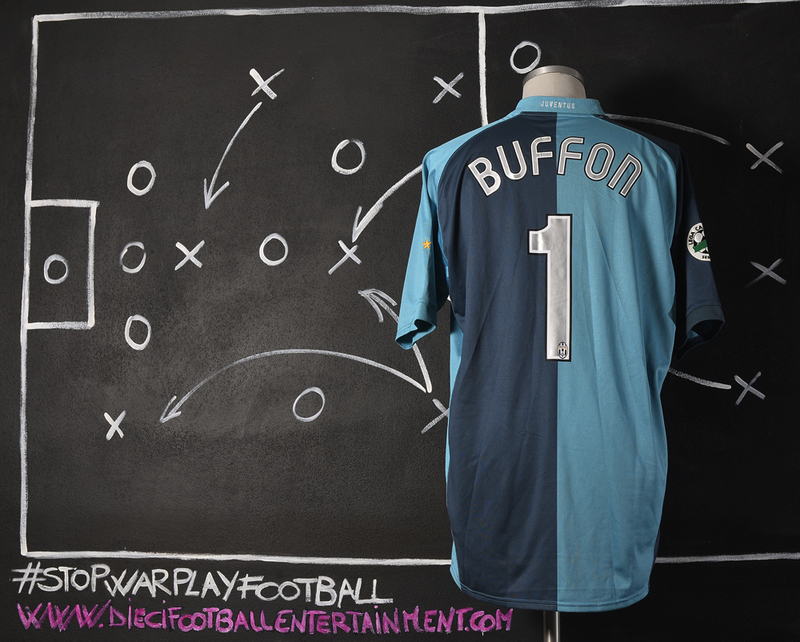 This shirt was worn by Gianluigi Buffon during Treviso vs Juventus which took place in Treviso on October 16th 2006. The shirt was swapped after the game by Gianluigi Buffon with the Treviso team’s striker Dino Fava Passaro which we get it from. See below Dino Fava holding the shirt before he gave it to us. 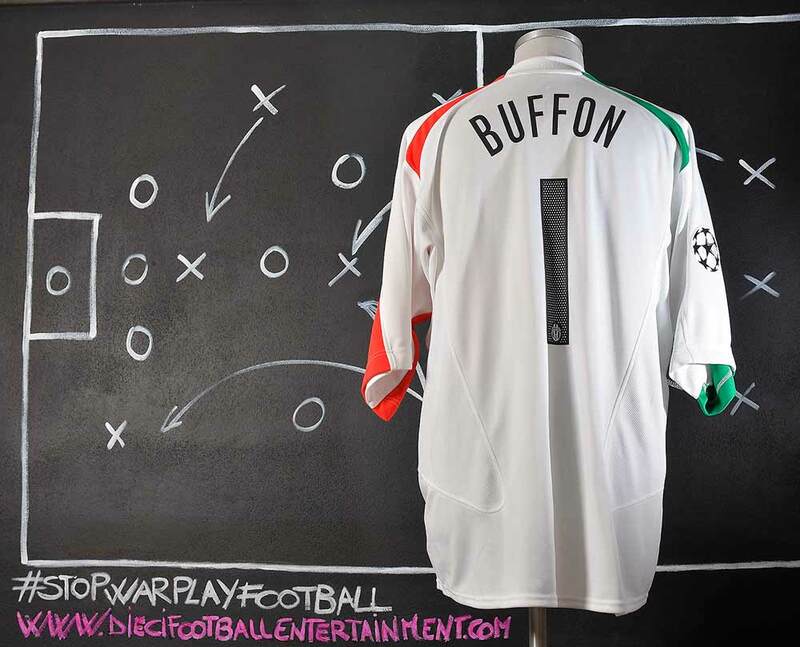 Despite of most of the team’s good players who left the team after the Calciopoli’s scandal there were many good players who decided to stay including some fresh world champions like Alessandro Del Piero and Gianluigi Buffon and some world class players like Pavel Nedvěd, David Trezeguet and Mauro Camoranesi, for the following 2006–07 Serie B season. These players became authentic fan’s idols. 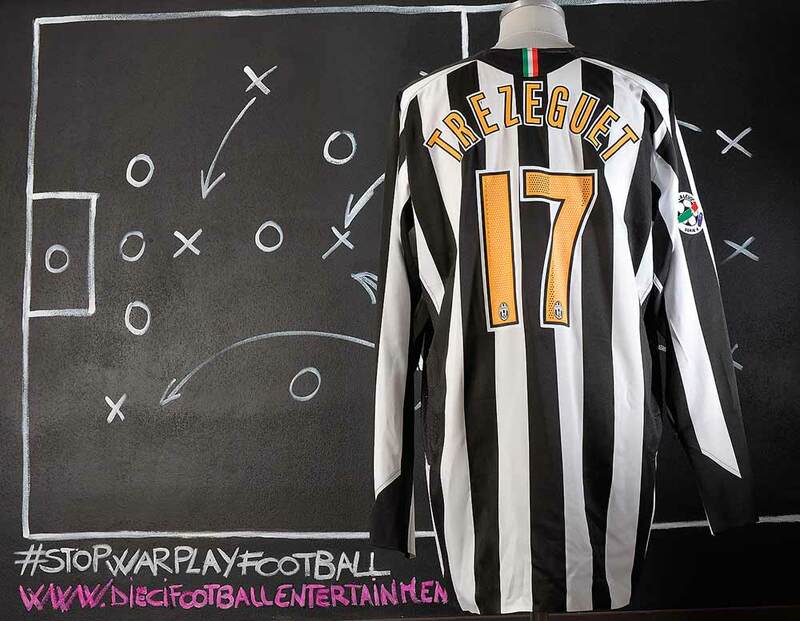 In order to go back as soon as possible to Serie A the team signed another authentic piece of Juventus’s history. In July 2006, former player Didier Deschamps was announced as the new manager following the resignation of Fabio Capello, who left for Spanish club Real Madrid. 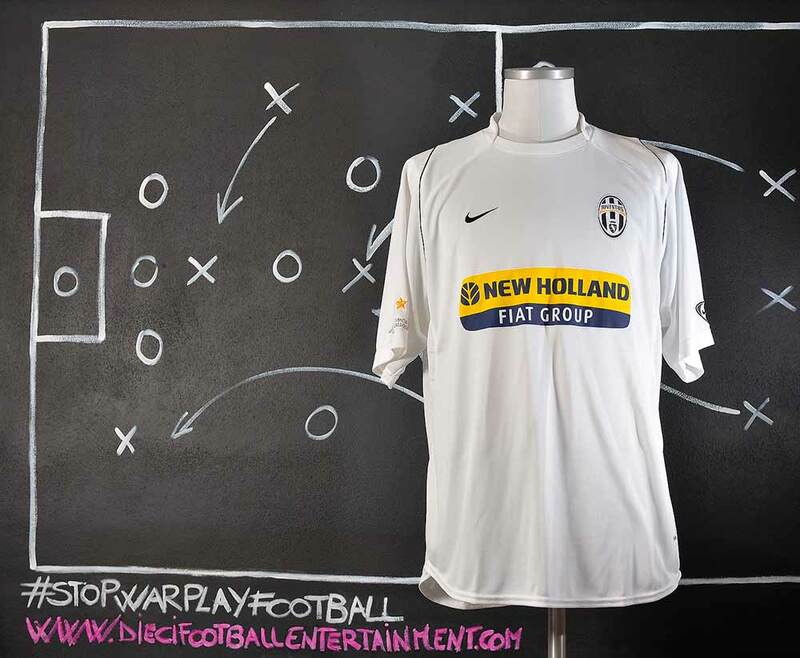 During the season 2006-2007 there was the Juventus F.C. 110th anniversary. To celebrate the anniversary a Juventus F.C. former player’s parade was organized before a Serie A game at the Stadio Olimpico. All of the most popular team former players attended the parade and it was given to all of them a special Juventus’s shirt with a commemorative badge on sleeve representing the 110th anniversary and the name on the back. Only one shirt for each player was made. 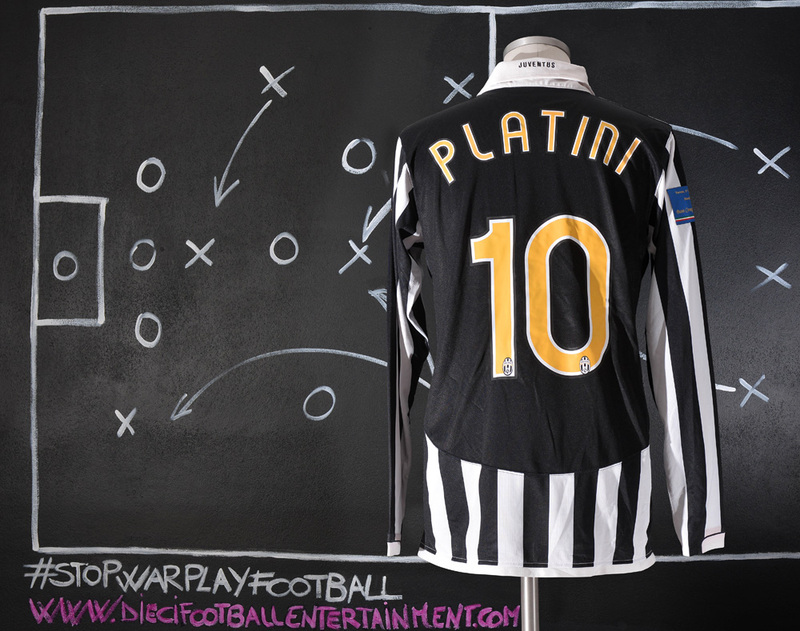 This shirt was given to Michel Platini and it was signed by many team former players that attended the parade. This shirt is a very particular shirt as it supposed to be the Champions League shirt for the season 2006/2007 since it has the black square on the back (typical for Champions League competition due Uefa rules). 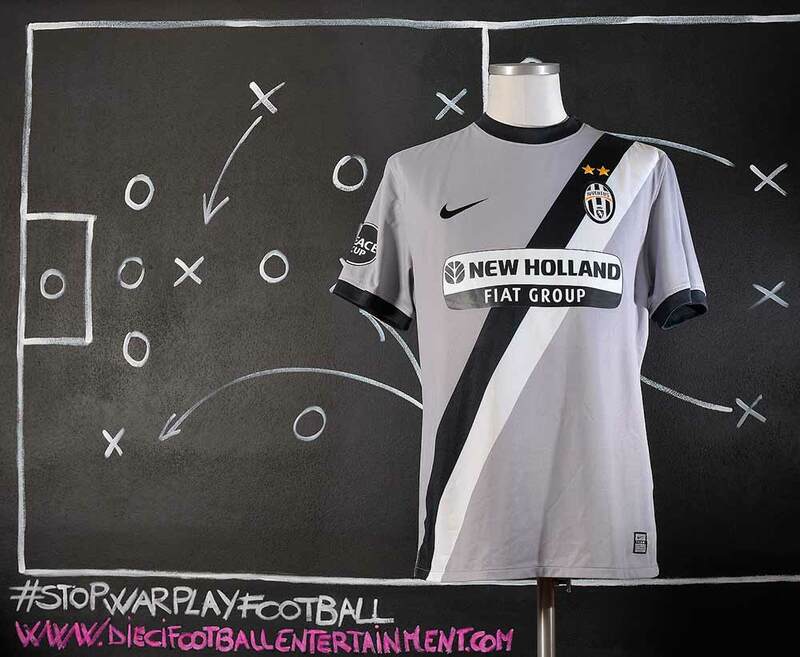 Nike prepared this style of shirt in advance and they couldn’t expect that due Calciopoli’s issue the team was not going to play the Champions League competition. So this style of shirt was prepared, but never used by the team. 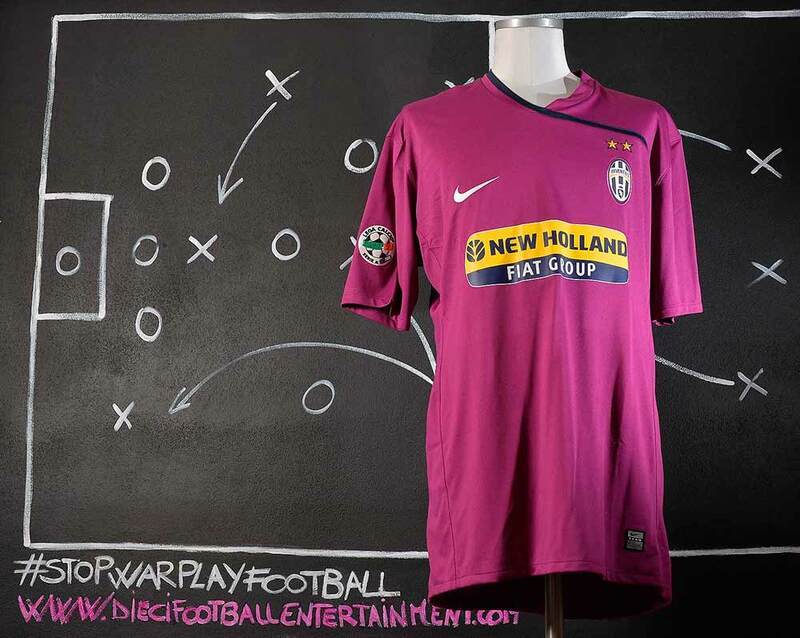 This shirt comes from the game when Juventus made its Serie B debut on 9 September 2006, earning their first ever point in Serie B with a 1-1 draw away to Rimini. Giovinco was promoted to the first team during the 2006–07 season and also played his last season in the Primavera squad. 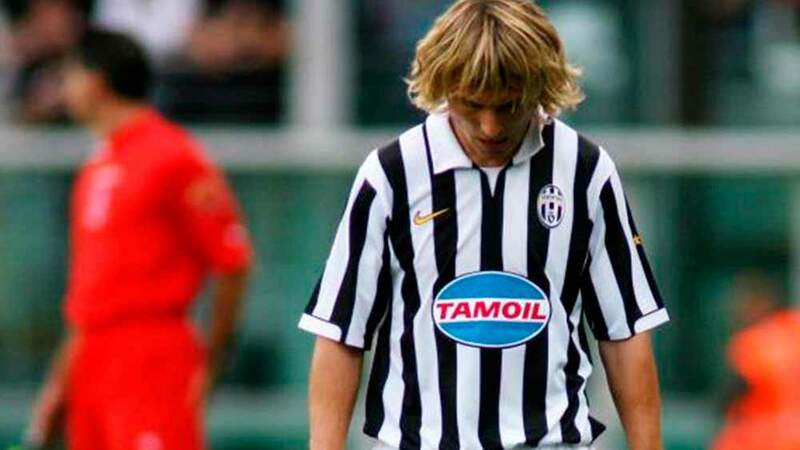 His professional debut came on 12 May 2007, in the Serie B match against Bologna; he came on as a substitute in place of Raffaele Palladino, and marked his first appearance with an assist for David Trezeguet’s tap-in. Since then, he had been tipped to be Alessandro Del Piero’s heir in the creative number 10 role behind the main striker, known as the trequartista, rifinitore, or fantasista, in Italian. 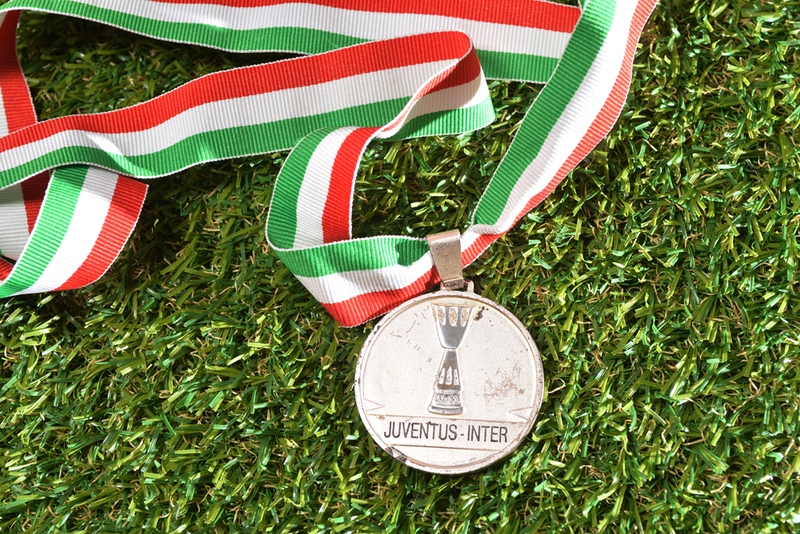 Juventus won the Serie B title that season, earning promotion to Serie A the following season. After joining the Juventus youth system, Giovinco flourished through the ranks of the club and impressed especially during the 2005–06 season, winning the Campionato Primavera, as well as the Coppa Italia and Supercoppa Primavera, and also reaching the final at the Viareggio Tournament, where he was named best player of the competition. Giovinco was promoted to the first team during the 2006–07 season and also played his last season in the Primavera squad. 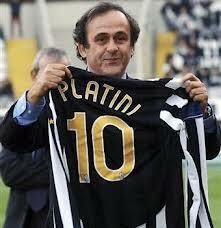 On 19 May 2007, after a 5-1 away win at Arezzo on the 39th matchday, Juventus was mathematically promoted to Serie A. On Matchday 40, Juventus were then crowned Serie B champions following a 2-0 home win to Mantova On 26 May, it was confirmed that Deschamps had resigned as manager due to differences with the club hierarchy, especially director of football Alessio Secco. His assistant Giancarlo Corradini was appointed caretaker for the last two games. On 4 June, Claudio Ranieri was announced as the new manager on the club website as Corradini stepped down to take up another management job full-time. The 2007–08 season was Juventus Football Club’s 110th in existence and first season back in the top flight of Italian football. Claudio Ranieri was appointed the new manager following the resignation of Didier Deschamps. With the club back in Serie A, new signings such as Czech international Zdeněk Grygera, Portuguese midfielder Tiago Mendes and Sergio Almirón were brought in to strengthen the squad while promising youngsters such as Sebastian Giovinco, Claudio Marchisio and Paolo De Ceglie were sent out on loan or co-ownership deals. Juventus finished third that season to qualify for next season’s Champions League, their first participation in that competition since 2005-06. Notable results included victories over rivals A.S. Roma, Inter, A.C. Milan and Lazio in the second half of the season. 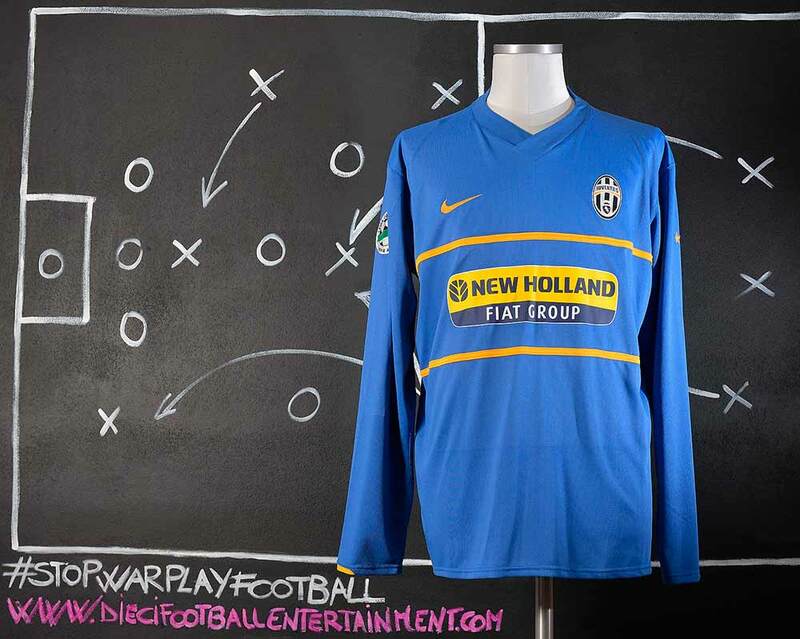 This style of shirt was only used in the “TROFEO BIRRA MORETTI” against Napoli S.S.C. 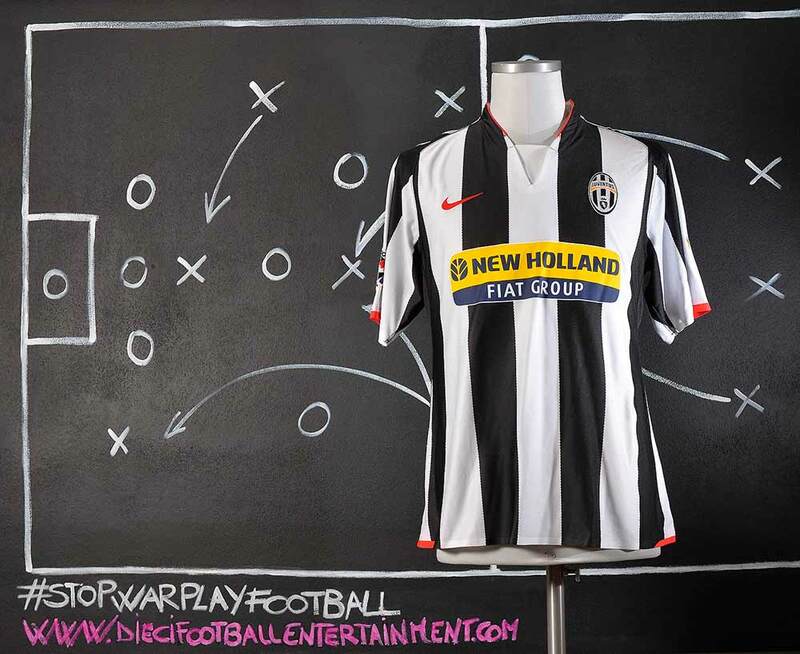 It was perhaps the same style of the previous season 2006/2007 with a different sponsor. 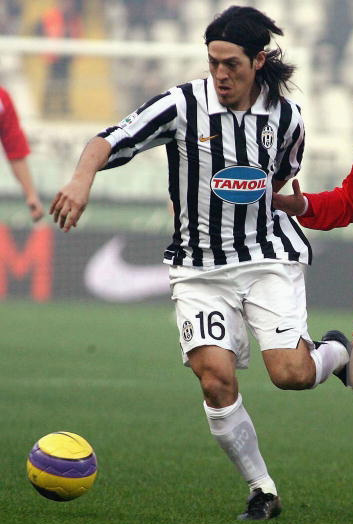 Juventus signed Iaquinta on a five-year contract on 19 June 2007 for a fee of €11.3 million. (cash plus Michele Paolucci), to become the Turin giant’s first signing for the new campaign. Udinese also bought back Fabio Quagliarella from Sampdoria on 21 June; Sampdoria then bought Andrea Caracciolo from Palermo on 22 June and Palermo bought Fabrizio Miccoli from Juventus on 5 July. 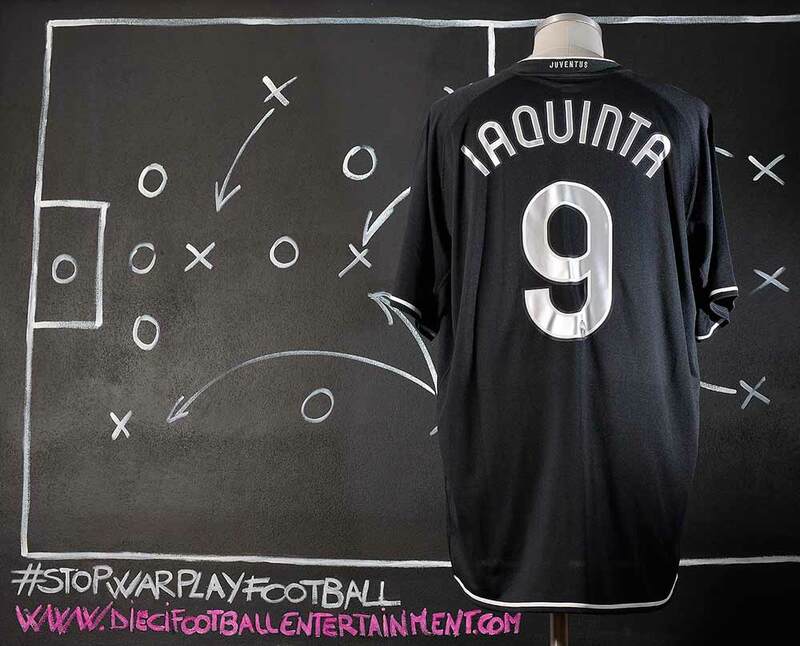 During the 2007–08 season, Iaquinta made only a handful of starts for Juventus, mostly being used as back-up to the experienced strike partners Alessandro Del Piero and David Trezeguet, who combined to score 41 goals between them in the Serie A alone. He did however still manage 29 appearances with 9 often crucial goals, such as his last minute winner versus Napoli in April 2008. It appeared that he might be surplus to requirements after the signing of Brazilian striker Amauri, leading to rumors about a possible move out of Juventus. However, nothing materialized, and Iaquinta remained for the 2008–09 season. Iaquinta also signed a new 4-year contract near the end of 2008–09 season. At various points in the season, Juventus looked as though they could challenge rivals Internazionale’s stronghold over Serie A, most notably in November 2008 following five successive wins, in late January 2009 after a seven-game unbeaten streak and again in March 2009 after another series of seven games without losing, which included impressive 4–1 successes over Bologna and Roma. Coach Claudio Ranieri, however, seemed to encounter serious problems in motivating his troops with his constant belittling of Juventus’ title chances. Juventus began the Champions League brightly, going unbeaten in their six group games and topping their group. These positive performances saw the Italians beat Spanish champions Real Madrid both home and away. Alessandro Del Piero, who scored a brace at the Santiago Bernabéu just four days before celebrating his 34th birthday, earned himself a standing ovation from the notoriously hostile Madrid crowd. The knockout stages were much less rejoicing for the Bianconeri. They were knocked out by English club Chelsea who had just changed their manager. Despite battling with ten men in the second leg, Juventus drew the game 2–2, meaning they were eliminated after the 1–0 loss in London. In the 2008-2009 season Alessandro Del Piero lived one of his most emotional moment in his career. Juventus were drawn into the same Champions League group as Real Madrid, and UEFA Cup winners Zenit Saint Petersburg. Del Piero marked Juventus’s return to the competition with a match-winning free kick to seal a home win against Zenit. On 21 October, Del Piero netted a notable goal as Juventus defeated Real Madrid 2–1 in Turin, scoring with a first-time, curling strike from distance, in the fifth minute of play. On 5 November 2008, Juventus and Real Madrid squared off at Santiago Bernabéu in the Champions League. The Italians won 0–2, their first away win against Madrid since 1962, and Del Piero was a key performer, scoring both goals, and drawing praise from Ranieri, as well as Real Madrid’s coach Bernd Schuster. As he left the pitch after being substituted, fans from both sides gave him an unbelievable standing ovation. 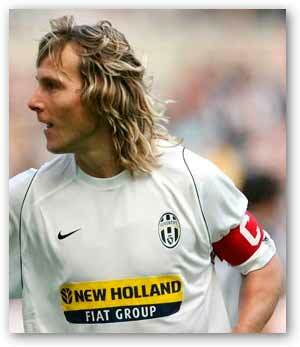 On 20 June 2007, shortly before the transfer window deadline, Juventus redeemed him for a sum of €2.5 million. During 2007–08, at age 24, he carved out a starting spot on the left wing of the defence of Juventus, thanks to the movement of companion Giorgio Chiellini to central defence. In his second season at Juventus he debuted 13 August 2008 in the first leg of the third qualifying round of the Champions League, won 4–0 against Petržalka, which also represented his debut in European competition. On 28 November 2008 he extended his contract with Juventus until 2013. He finished the 2008–09 season prematurely because of a perirenal hematoma. Molinaro received his first international call-up on 6 August 2010 under new head coach Cesare Prandelli. He made his debut on 10 August 2010, starting in the match against Côte d’Ivoire. He was also called up for the games against Estonia and Faroe Islands in the Euro 2012 qualifiers. 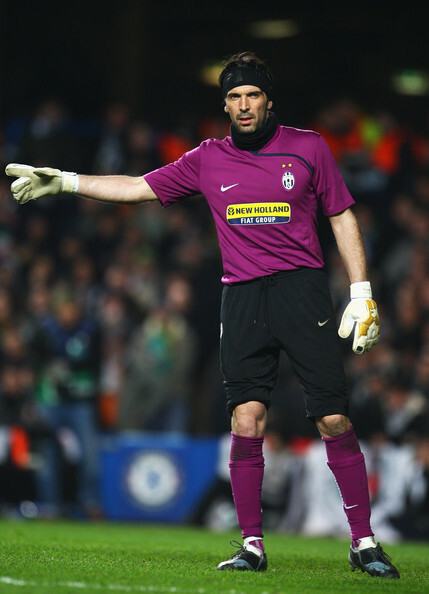 In the 2008–09 season, Buffon was once again sidelined by several injuries. From September through January, reserve goalkeeper Alexander Manninger held his position between the sticks, gaining praise for his deputising. Due to recurring injuries, Manninger’s performances and Juventus’s poor form towards the end of the season (as Buffon was seen despondent whilst the team drew with both Lecce and Atalanta), there were further rumours that Buffon was displeased and wanted to part ways with the club. He admitted he was disappointed with the current results, but assured that he had no intention of leaving. After a discussion with management, he said he was reassured about the club’s future and signed a contract extension to 2013. Buffon and Juventus finished the season on a high note, with two victories, finishing in second place behind Internazionale. They were knocked out of the Coppa Italia semi-finals by eventual champions Lazio and of the Champions League in the round of 16 by Chelsea. 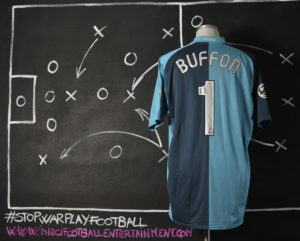 Buffon was nominated for the FIFA World Player of the Year in 2009 for the sixth consecutive season since first being nominated in 2004. 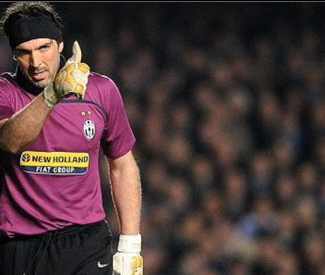 Buffon made his 300th appearance for Juventus in a 3–3 home draw against Chievo in 2009. With the arrival of Italy international Fabio Grosso and Uruguayan Martín Cáceres in the summer, Molinaro signed a loan deal with VfB Stuttgart on 5 January 2010 which initially saw him stay at the club until the end of the 2009–10 season. On 1 June 2010, VfB Stuttgart took advantage of a contract option and signed Molinaro permanently until June 2014. Juventus announced that on 14 June they received €3.9M transfer fees and the deal was completed. Domestically, the team competed in Serie A, finishing seventh, as well as in the Coppa Italia, where they were eliminated in the quarter-finals. Having finished second in 2008–09, Juventus automatically qualified for a place in the group stage of the UEFA Champions League. 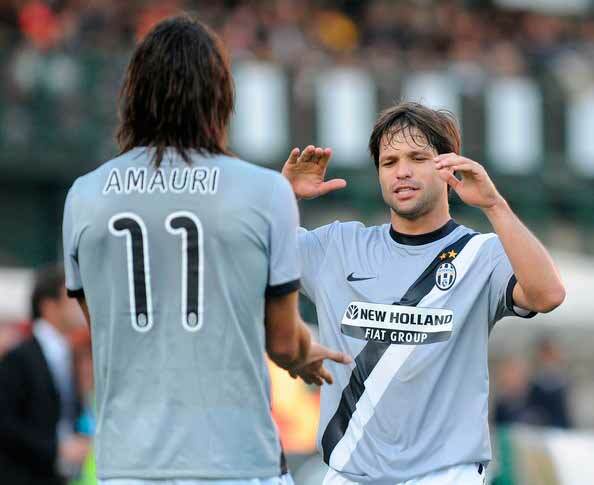 Iaquinta started the season as fourth-choice striker, but enjoyed a particularly impressive string of performances when both Amauri and Trezeguet were injured, gaining a more regular place under Claudio Ranieri. Most notably, he scored the first goal against Chelsea in the second leg of the first knockout stage of the UEFA Champions League, which was also Juventus’ 600th goal in European competition. Despite this, Juve could only draw the match 2–2, and were eliminated. 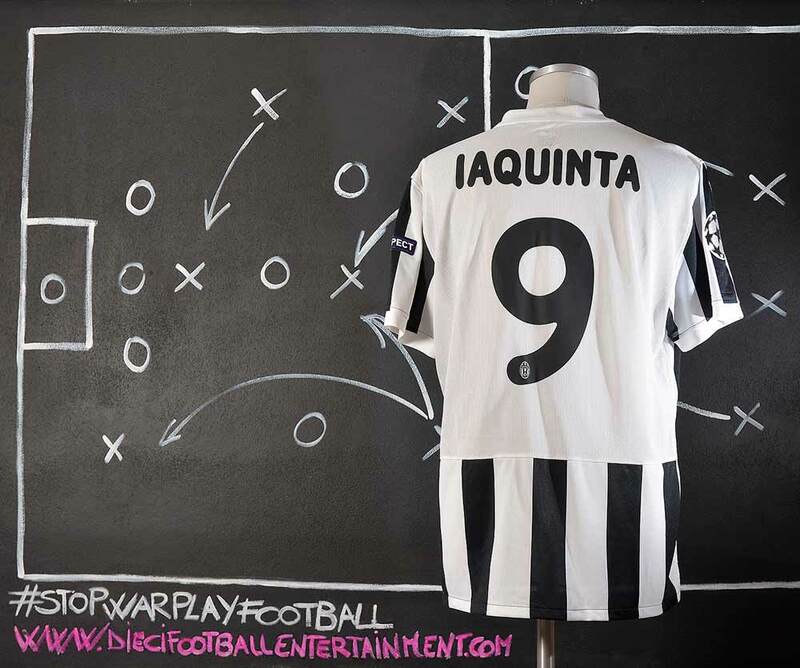 After that, Iaquinta also played regularly in Serie A games, his situation helped by a falling-out between Trezeguet and head coach Claudio Ranieri. In his second season in Piedmont, the striker managed 38 appearances with 16 goals. Following the sacking of Ranieri, and the appointment of Ciro Ferrara for the 2009–10 season, Iaquinta became an undisputed starter, before a major injury side-lined him for 6 months between October 2009 and March 2010. The team finished third in its group and qualified for a place in the Round of 32 in the UEFA Europa League. In this secondary competition, Juventus were knocked out in the Round of 16 after the second leg ended as a 4–1 (5–4 on aggregate) loss for the second time in Europe, this time in England against Fulham. On 17 July 2009, Del Piero extended his contract with Juventus by one more year until 30 June 2011 in Pinzolo while training for pre-season, thus practically ensuring that he would retire at the club with which he started his professional career.During his renewal, he said, “I am happy at Juventus and we are competitive. I want to keep playing for as long as I can and I’m certain that for at least two more years I will be at the top level.” On 14 February 2010, Del Piero marked his 445th Serie A appearance, breaking the all-time club record previously held by Boniperti, with a brace in a 3–2 win against Genoa. 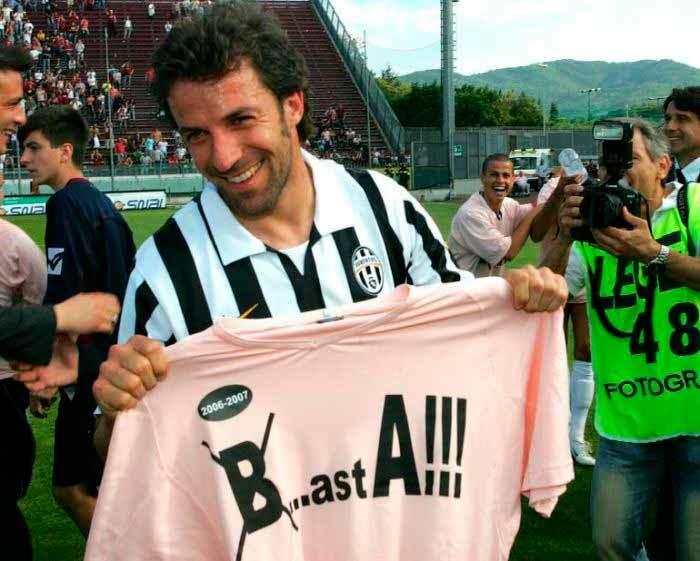 Del Piero finished the season as the all-time top scorer for Juventus, having scored over 250 goals in all competitions with the club, and having also made over 600 appearances in official matches for Juventus, breaking Scirea’s appearance record. On 14 March 2010, Del Piero recorded his 300th and 301st career goals during a 3–3 draw with Siena, with the first two goals coming in the second and seventh minutes. In January 2008 Sissoko transferred to Italian club Juventus, where he would team up with former coach Claudio Ranieri, for a fee of €11 million. He made his first appearance for the club in February 2008, coming in as a 67th minute substitution for Tiago in a Serie A fixture versus Cagliari Calcio. 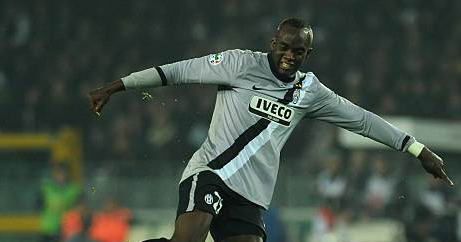 Sissoko scored his first goal for Juventus on 2 March 2008, the equaliser against Fiorentina. During the first half of the 2008–09 season, he regularly featured in the starting line-up, forming a partnership with youngster Claudio Marchisio as the centre midfield pair in Claudio Ranieri’s 4–4–2 formation. His season ended early after he broke his foot in March 2009 ruling him out for the rest of that season and into the start of the 2009-10 season. Sissoko’s injury problems continued throughout the rest of the 2009-10 season and into 2010–11 season, as he suffered thigh strains, a leg strain, Achilles tendon inflammation, and finally season-ending knee surgery in March 2011. 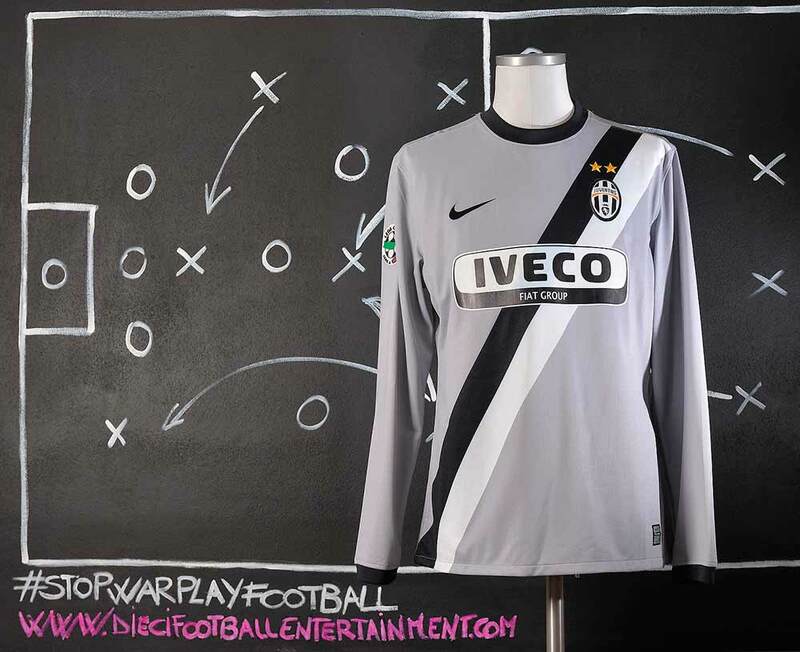 This shirt with IVECO sponsor was used only in the game Udinese vs Juventus. It was never used anymore. 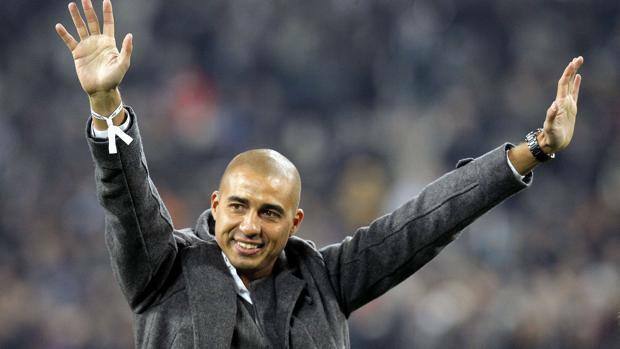 At the end of the 2009–10 season, Trezeguet ranked fourth among Juventus’ all-time top goalscorers with 171 goals. In August 2010, he was released from the remaining 12 months of his contract by Juventus. On 30 August 2010, Trezeguet completed his move to newly promoted La Liga team Hércules CF on a two-year deal in the Spanish La Liga. 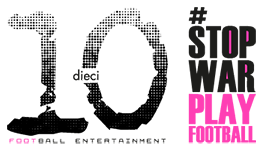 The Peace Cup is an invitational pre-season friendly football tournament for club teams, currently held every two years by the Sunmoon Peace Football Foundation. It is contested by the eight clubs from several continents, though 12 teams participated in 2009. The first three competitions were held in South Korea, and the 2009 Peace Cup Andalucia was held in Madrid and Andalusia, Spain. Previous winners are PSV, Tottenham Hotspur, Lyon, Aston Villa, and Hamburger SV, who are current champions. The team attended the 2000 edition losing the Final against Aston Villa.